On the 28th of January, the start of the International Year of Indigenous Languages (IYIL) will take place. IYIL is an initiative by the United Nations and is organised by UNESCO. International Years are organised yearly, with the goal of creating awareness for a particular issue of current importance to earth and/or mankind, and to allow and mobilise people to take action for a certain cause. Already in 2016 did the UN decide that 2019 would be the year of indigenous languages, because these languages are currently dying out at record speed. As a linguist, I’m all too familiar with the depressing statistics surrounding indigenous languages. As is summarised on websites like Ethnologue, around 4000 of all the ca. 7000 languages in the world are spoken by a meager 2% of the world population. The eight most spoken languages in the world (a little over 0.01% of all languages) are spoken by no less than 40% of the people in the world. It is estimated that half of all the world’s languages will be extinct by the end of this century, but so far no action has been taken against this on a global scale. Why should we pay any attention to this? Many people don’t particularly care about the fact that languages become extinct; whether it’s one language or the other we use, as long as we can communicate, one might say. And there are enough other languages. In that regard, the extinction of languages is to a large extent comparable to the extinction of animal species. Some people are saddened by the fact that animals die out, but others might say their time has just come. Natural selection we call that. This is however not always true; although countless animal species have indeed become extinct as a result of natural selection, the rate at which they are currently dying out is unprecedented compared to the time before humans set foot on earth. And currently the great majority of cases of extinction are in fact caused by man (e.g. the eskimo curlew, the great auk, and the dodo). With languages, this is actually not entirely different. Sometimes people say that the extinction of languages is the result of natural selection, like David Mitchell suggests in his usual comical manner in this clip. In fact however, most cases of language extinction are caused by external pressure on a society, and is usually caused by other people. Speakers of a certain language switch to another language than their mother tongue to such a degree that at a certain point nobody speaks the language anymore, and the language then becomes extinct as a result. This can be triggered by annexation of a territory, social pressure from a dominant group of speakers of a larger language, government-driven language policies, etc. How ‘safe’ a language is, is dependent on i.a. how large a speaker community is and how much territory they have at their disposal. Their economic and social status also plays a part, as well the extent to which they are able to fend for themselves in daily life without any external aids. Obviously this has little to do with natural selection. Language extinction, also called language death, where a certain language is driven out by a more dominant language, is something I witness regularly in my own work. I research Papuan languages spoken in Indonesia, where national policy dictates that the use of any other language besides Indonesian is forbidden in school, to the point where in the 1970’s the use of local languages would still be rewarded with physical punishment. Now, of course, it is of importance for a nation that as many people as possible speak the national language, but the rigidity of this policy has also caused many speakers of smaller, local languages to feel oppressed. 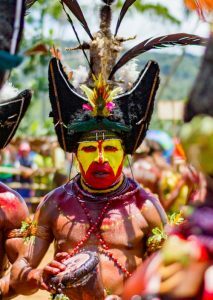 In this clip, for instance, you can hear how members of the Abui clan, who live about two hours removed from my own field site, talk about how they experience their own language being driven out. It is simply not always the case that people like you and me, can just speak our mother tongue on an everyday basis. Many languages and their speakers are in fact oppressed daily, be it direct or indirect. Reta children on Pulau Pura. Photo by: Jeroen Willemsen, 2016. Because I see it as a basic human right to choose one’s way of life as well as the language one chooses to speak, I find it uplifting that the UN is currently making an effort to create awareness about this. Encouraging language diversity stands for tolerance, and tolerance is all too often lacking. This is something you see in the way elders speak about ‘modern’ language use; if it is poorly understood, it will probably be seen as backward and ignorant. Activities like those promoted by IYIL help create the awareness about, and tolerance towards indigenous languages and cultures. It is probably clear that it is the humanist in me, and not so much the researcher in me that is responsible for the above paragraphs. The reader might wonder whether are any academic arguments for language preservation as well. There are. Languages are studied by linguists in a scientific fashion. Just like animals, bacteria, plants and tectonic plates are studied by other scientists. And in order to do this as well as we can, we need to compare data on as many languages as possible; you can never get a good understanding of what language actually is if you only compare a handful of them. And if a language disappears, it does not leave the same traces as for instance tools or fossils that can be excavated by archaeologists, DNA that can be analysed (millions of) years after extinction, etc. If a language is gone, it’s gone. And sadly, thousands of the world’s languages have either been documented poorly or not at all. Fieldwork in North America. Used with permission from Mikael Parkvall. In addition, many linguists busy themselves with the comparison of phenomena in different languages in order to draw conclusions about language in general. If, for instance, in a particular language the direct object comes after the verb, this language will most likely also have prepositions. If the direct object comes before the verb, the language will probably have ‘postpositions’. Based on these kinds of facts, we can then construct theories about how language works. And this can then be applied to search machines, computational linguistics and translation software. What linguists are also fond of doing is the comparison of word forms across related languages to get an idea of how the ancestor language of two or more languages might have sounded. For instance, we currently have a fairly decent understanding of how the ancestor of all Germanic languages, proto-Germanic, sounded like. 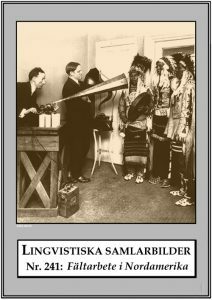 Not only do we then learn about an already extinct proto-language, we also learn more about the history of its speakers. And sadly, although we know a fair bit about the history of European languages, we often know next to nothing about the more ‘exotic’ type of languages in the world. And then there is the wealth of indigenous knowledge such as oral history, traditional poetry, myths and sagas, ritual speech, and indigenous knowledge about flora and fauna that is lost whenever a languages dies. The theories and observations about grammar and word forms that I mentioned above are, unfortunately, based on an all too small number of languages, so we actually don’t have an optimal understanding about how diverse languages can be. And while we’re currently working hard to gather as much information as possible, languages are dying out at an unprecedented rate. For linguists, it’s a race against the clock. 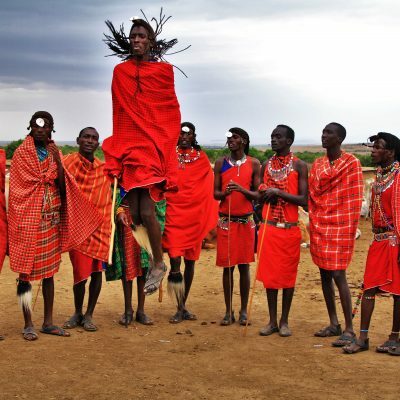 An initiative such as the International Year of Indigenous Languages enable us to become more aware of indigenous languages, by being confronted with them, by learning about them and talking about them, and by mobilising people and institutions to take action indigenous languages and cultures. The official kick-off event will take on the 28th of January 2019 in Paris. I thank Arok Wolvengrey for the translating the term International Year of Indigenous Languages into Cree, and Refael Molina for checking my translation into Reta. Jeroen Willemsen is a researcher in linguistics at Aarhus University. He is among other things working on a grammatical description of the Reta language. Extremely relevant and informative blog post. We should do everything we can for dying indigenous languages.